International (DBS) —Deaf Bible Society (DBS), a non-profit organization that supports Bible translation work in Deaf communities around the globe, has a straightforward mission: God’s Word in Every Sign Language. But DBS faced some obstacles to this mission related to language and training. First, it was unclear exactly how many sign languages existed. Second, many Deaf people who worked to translate the Bible into their own sign languages did not have enough training. Third, there was a shortage of skilled consultants and translation resources in sign languages to support quality checking for the parts of the Bible being translated into various sign languages. DBS took action to collaboratively address these barriers for Deaf Christians working to translate God’s Word. In July of 2018, DBS launched the Institute for Sign Language Engagement and Training (ISLET), a team with expertise in translation, curriculum development, and linguistics. The Institute’s aim is to research sign languages, provide training to translators, and raise up more consultants to support the sign language Bible translation movement. ISLET conducts language research to address the question, “How many sign languages exist around the world?” In partnership with other non-profits involved in Bible translation, ISLET has developed Aveditz, a collaborative research tool that compiles information about all of the known sign languages of the world. This makes it easier for people to see which Deaf communities have access to the Gospel in a language they understand well, and which communities still need to be engaged. ISLET also partners with local Deaf communities who want to study their sign languages and answer questions like “How many sign languages are used in our country?” or “Could our community understand a Bible translation filmed in a far-away city?” By engaging in language research, ISLET helps DBS and its partners measure progress in seeing God’s Word made available in every sign language. In addition to language research, ISLET trains Bible translators working on sign language projects. In late summer of 2019, ISLET is launching the Josiah School of Translation. Through this program, Bible translators will develop practical skills to support their translation work including principles for interpreting the Bible, administrative skills, translation principles, the linguistic structure of their sign languages, and advanced video production skills. Each of these areas will equip translation teams to produce Bible translations that fully communicate the richness of God’s Word in ways that are most meaningful to Deaf communities. Over the course of three years, teams will receive six months of training, positioning them to thrive in the long term. Finally, ISLET prepares qualified translation consultants to provide accessible support and feedback to Deaf translation teams. Before any video of a translated Bible portion can be published, it must go through a quality checking process guided by a translation consultant. If there are no consultants available for this checking, new translation projects cannot start, and active translation projects are delayed. Currently, one of the biggest roadblocks to sign language Bible translation work – impacting teams from Asia to the Americas – is the shortage of consultants who are proficient in at least one of the world’s sign languages. ISLET is developing training and assessments that will equip consultants to provide quality support to translation teams. Additionally, ISLET is collaborating with other Bible translation stakeholders to develop specialized software that supports the Bible translation task and improves communication between consultants and translation teams. By innovating and engaging with Deaf communities, ISLET’s work fosters academic rigour and bolsters Bible translations that are grounded in the realities of each language context and communicate clearly to Deaf communities. Addressing Bible translation barriers related to language and training brings Deaf Bible Society one step closer to seeing God’s Word in Every Sign Language, accomplishing the Great Commission call of DBS and its partners. Header and story images courtesy of Deaf Bible Society. Update: We have just received word that Wayne, Autumn, and Joseph have been deported and crossed the border into Thailand Thursday afternoon. Laos (MNN) – Lao authorities detained three Americans in the Luang Namtha province and seized their passports 10 days ago, accusing them of ‘disseminating religion’ without proper approval. From Where Does The Pressure Come? Article 18 Everyone has the right to freedom of thought, conscience, and religion; this right includes freedom to change his religion or belief, and freedom, either alone or in community with others and in public or private, to manifest his religion or belief in teaching, practice, worship, and observance. Palestine (MNN) – Christians in the Arab World are typically the minority population. This includes in the Holy Land where Christ was born. However, it does not mean Arab Christians fall in line with the politics of their Western brothers and sisters. One particular area—the Israeli/Palestinian conflict. Many Christians specifically in Israel and Palestine and even countries such as Jordan are actually of Palestinian nationality. However, these Christians are a minority because of both their religious and their citizenship. Read about Palestinian Christians here. George, an Arab Christian associated with Program for Theological Education by Extension, says there are situations where Christians from the West come to the Arab World and try to convince their Arab brothers and sisters of their own political stance regarding the Israeli/Palestinian conflict. Often, these political views pushed onto the Arab Christians lack a deeper understanding of the complexity of the conflict and how it affects the rest of the Arab World. “Israel is a complicated issue in our area…the religious and the political level. So, they need to separate between serving God and their stance towards Israel. If there are, let me say, missionaries who want to come and serve God or people who want to serve God but [they believe], they have some kind of, let me say, special belief about Israel, they need to come keeping this faith for them,” George says. George is not asking anyone to change their political stance but to be aware of the context surrounding it. Promoting a pro-Israel stance comes across as political and damages the Gospel message in the Arab World context. Also, some Arab Christians disagree with the pro-Israel view for theological reasons. George says politics is not religion, and in the Arab World these two need to be separate. Religious work needs to be conducted without a political agenda. “We have our reasons, theologically, [not] politically [for not being pro-Israel]. And in addition to that, [Christians] need to remember that…the first century, those Jews who did not believe in Jesus were cut out of, were cut [out of] Jesus,” George says. George recommends for Christians who have a heart for Israel to perhaps consider outreach in Israel rather than pursuing a political stance internationally. Second, trust God. Pray for God’s hand in the Israeli/Palestinian conflict as well as for the global Church to stand with its family in Christ, not against it. Finally, pray for God’s love and truth to penetrate the hearts of those who don’t know Him. Header photo courtesy of Anton Mislawsky via Unsplash. Middle East (MNN) — Winter is coming to an end. For many refugees in the Middle East, it’s been a season of extra difficulties and worries about survival. “Winter in general in the Middle East is very hard, cold, windy. [There are] many storms [and] heavy snow, especially in Lebanon,” Tent Schools International’s Rawan Haddad says. Refugees must prepare themselves while they’re in the camps, she explains. However, some things are out of their control and they cannot provide for their families. Haddad says relief agencies are working to provide refugee families with shelter, food, and water, but the need is endless. Also, due to the cold and distance, winter forces many children to stop attending school. Since classrooms are poorly heated, kids stay cold and wet and can get sick. As a result, most children stay in their tents, trying to stay warm and healthy. Tent Schools is setting up their schools inside refugee camps to provide refugee kids with education and a warm place to go during winter months. Tent Schools’ programs implement daily Bible studies with their students. In turn, they request prayers for their family members, friends, and their country. If children have become Christians, they often have to keep it a secret. However, even if children remain Muslims at heart, Tent Schools’ teachers are helping them learn how to love and care for others. Furthermore, teachers are developing positive relationships with students’ parents. Though winter is coming to an end, Tent Schools needs your help to prepare for the future. Put worries of survival for next winter at ease for refugees by helping to establish tent schools in camps. Be a financial partner with Tent Schools, starting here. Also, continue praying for refugees around the world. Pray for the Lord’s provision and protection, and that He would instill an undying hope for the future in their lives. International (MNN) –Google the phrase ‘anti-Muslim’ on a news website and you’ll get a page full of political stories from around the world, along with a smattering of terms like ‘Islamophobia’ and ‘hate speech’. The rise of terrorism and extremism is hard to deny. It’s increasingly difficult to separate the issues of national security from religion. It’s a topic fraught with controversy and high emotion. Chris Ruge, Prayercast director and overseer of the project ‘Love Muslims’ says Islam is an ideology. Taken to the extreme, you see violence. Ruge says there is a distinction between Muslims and terrorists but observes that much of the divisive dialogue and rhetoric seems fear-driven. With the advent of the Islamic State (ISIS) and its subsequent rampages throughout the Middle East and North Africa, its fighters gained a fearsome reputation. Then stories began trickling out of some of these fighters having dreams and visions of Jesus and finding themselves profoundly affected. Ruge took that to heart and started thinking about ways to help other Christians actively, knowledgeably and passionately pray for Muslims, despite a growing anti-Muslim sentiment. Enter: ‘Love Muslims’. ‘Love Muslims’ is a counter-culture movement, since the vocabulary that comes with ‘Islamophobia’, ‘hate speech’ and ‘anti-Muslim’ usually includes words like ‘bigots’, ‘racists’ and ‘hypocrites’. Strong language deserves a strong response, but one in a context that reflects the hope of Christ. From May 5 through June 4, “We are going to be leading a 30-day prayer journey, through the month of Ramadan. When people sign up, we’ll send an email each day as a reminder. We’ll be releasing a brand new video, never seen before, every day during the month of Ramadan.” Click here to sign up. Jordan (MNN) – There comes a point when the lines between ministry and work get blurred, and when they do, casualties occur. The same thing happens when ministry becomes an idol or expectation rather than an honest heart search and a conviction to serve others. By unintentionally harming the people the Christians came to serve. George, an Arab Christian living in Jordan associated with Program for Theological Education by Extension, shares his thoughts. “Some people from the West try to save us, but this has two problems. The first one is really the one who works in the heart is God himself. So when they try to help us out of our problems and many difficulties, persecution and all of this, they can’t,” George says. One example—religious freedom. Freedom of religion in the Arab World varies from country to country and some organizations have taken it upon themselves to defend religious freedom in the region. However, despite their good intentions, this can be problematic. Because of the way some of these organizations choose to support religious freedom, specifically for Christians, they have insulted governments and caused more problems. Christians these organizations were trying to defend become greater targets in their countries. Furthermore, as George has said, these organizations cannot change hearts; only God can. Rather than attempting to change life as they know it themselves, Arab Christians like George are trusting God. But when people do help, George wants them to be aware of how their actions and words could impact the local Christians and hurt them. A piece of advice he offers—be respectful to the culture, the people, and the government. Even the Bible, in Romans 13:1-7 and 1 Timothy, talks about submission to governing authorities. Second, get educated. Learn about the complexity of the situation impacting local Christians. Ask local Christians about their experiences, listen to them and learn from them. If Christians do not listen to the local body of Christ, their mistakes will negatively impact those they are trying to help. “When some of them have some political position, stances, and they try to in a way convince us as Christians here or convince the government of these stances, this also does not help us. Let’s really try to separate politics from religious freedom. Politics and religious freedom, although they are in a way connected, are not the same thing,” George says. Finally, George says when Christians, particularly from the West, come to work alongside the local church, they need to serve, not save. Many Westerners have come to the Middle East, and other regions, with a savior mentality rather than an intention to serve. This has also dealt damage to the local Church. “We welcome everybody who wants to come and help us. There are a lot of things that we need help with here in the area. If they want to come and help us, we need it. We cannot deny that we need it,” George says. There have been situations where outsiders create a ministry that becomes central to the local community. But then when they leave, so does the ministry. George asks for Christians to search their hearts and ask themselves why they are leaving their home country. Is it really to humbly serve others and walk alongside a local Church to build it up, or are they traveling to a different country to ‘save’ it? “Leaving your country in itself does not mean that you are serving God, even if it’s religious work. Religious work does not mean it [is] ministry, it means work sometimes. This is something related to the heart,” George says. Christians should search their hearts before traveling abroad not because local Christians do not want help from their brothers and sisters, but because they want the help to be pure, honest, and God-honoring. George says PTEE has had non-Arab Christians serve with the ministry in the past who really had a heart for serving and building up the local Church. These Christians made a positive impact on the seminary program and the community, but they also served with honest hearts and open ears. “Some Western workers come and make…their communities here in the Middle East instead of serving the locals and serving the local churches and helping in whatever way needed…They need to be aware of this when they come to serve, not work…they need to have this mentality and they need to be part of…at least the church community,” George says. PTEE was established in 1981 by Arab Christians and Western Christians living in the Middle East. They saw the need for on-location, Biblical, theological education at the seminary-level which was not accessible to Arabic-speaking Christians living in the Arab World. Together, the foreign Christians and the local Christian leaders, through God, took the by-extension seminary from an abstract idea into a reality. Today, PTEE is run by Arab Christians for Arab Christians. However, George says the seminary has room for foreign Christians who fit a specific skill set in administration, some academia, finances, and other areas. Would you walk alongside PTEE and reconsider how you choose to engage with the global Church? Search yourself through prayer and also by asking, why do I want to help? Ask God to shape your heart. “They need to make sure they come remembering that as Jesus left everything, we at least need to make our work and ministry centered around Jesus himself and around the people [that] to whom we are going,” George says. Header photo by Tim Marshall on Unsplash. In the foothills of the lush Western El Salvador mountains, clean natural springs cascaded down ridgelines and bypassed an enclave of families living in poverty who are unable to access the fresh water. Here in rural San Julian is also the birthplace of Leonardo Britay Regalado, a former sponsored child who gained an unquenchable thirst for service and justice. Across El Salvador, the 13-year civil war had unleashed unspeakable violence, tremendous loss, and the upheaval of its people during the 1980s. The conflict forced thousands, including Leonardo’s parents, from lucrative metropolitan areas into the secluded foothills for their family’s survival. His father and namesake, Leonardo Sr., farmed tirelessly by growing corn and beans, modest and reliable crops needed to feed his family and for income. Dena, his mother, sold fruit from their trees. It often wasn’t enough for the parents of three. “Sometimes we had only a few tortillas and salt,” remembers Dena. With no running water at home, they bought bottles of clean water from the nearby town for drinking and cooking, and they bathed in the local river, a waterway littered with trash. Growing up, Leonardo was bothered that there were pristine springs in the nearby foothills, but government officials never piped the water consistently to his community. He remembers how powerless he felt. Fifteen years later, the kind and quiet Leonardo has grown formidable, becoming the leader he previously sought. At 7, Leonardo’s life changed through child sponsorship. “I thought it was good because it meant I could go to school,” he remembers. Because sponsorship funded his school supplies, shoes, and uniform, his family could spend their limited income on food and water, and he could attend school full time. also provided Leonardo’s family with food, and his mother learned about child nutrition through World Vision programs. Leonardo spent his time after school in the fields helping his dad. “He was always a hard worker,” remembers Dena. In his spare time, he also worked on other farms to support his family by picking bananas, oranges, mangoes, and corn. Dena remembers the day her son returned home, bug-bitten and exhausted, with the resolution to have a professional career. As he grew, he spent more of his days with World Vision. At age 14, he enrolled in World Vision’s community leadership training, a program that guides teens to identify community problems and find solutions. As a teen, he served as president of the Child and Youth Board of San Julian. He taught other children to dream bigger for themselves and their communities and to take the practical steps to make it happen. He encouraged other kids to stay in school. Leonardo is grateful for his sponsor. His sponsor’s sacrifice motivated him to invest in his own community. He says other children who were not sponsored often dropped out of school or migrated. He’s lost friends to the gang violence that has gripped El Salvador, but the lessons and values he learned from World Vision have set a different path for him. Leonardo calls World Vision “his second school.” Their training taught him a culture of peace, service, and integrity — values essential to the person he is now. It’s what he teaches young people. It’s what he lives every day, he says. In 2001, when Leonardo was 16, a massive earthquake struck the region. The family’s wood-and-tin home collapsed, so they lived under a plastic tarp under the trees. World Vision helped rebuild homes throughout the community, including theirs, out of sturdy concrete. A year later, he volunteered with World Vision to monitor and evaluate their programs, working his way through high school and the university to gain his bachelor’s degree. He knew he wanted to become someone who could help his community in practical ways. Now as the manager of the city water utility, Leonardo ensures that people throughout the region have clean water. As a civil servant, he is making the change he dreamed about as a child. Now, he has found efficiencies within the same budget to make sure pipes and the pumping station provide clean water to his community and many others. No one should have to go without clean water, he says. “I learned from my mom how to be humble and strong,” Leonardo says. Dena’s gratitude runs deep for her son’s sponsor. “I’m so grateful for peo­ple who help children around the world. I see God’s love through them. They love others like themselves and make sac­rifices to help,” says Dena. “Leonardo is the greatest gift from God,” says his mom. “It’s been my dream that my children would be respected and useful to society.” He’s recognized throughout San Julian for the work he’s done to make the com­munity better. As she reflects on how proud she is of her son, tears well up in her eyes and spills down her face. “These are tears of joy,” she says. Leonardo’s dad has been unable to speak since a stroke 13 years ago. But as his mom speaks, a tear runs down his dad’s cheek. It speaks volumes of how proud he is of Leonardo. The post A former sponsored child’s unquenchable thirst for service appeared first on World Vision. On the eve of the 2016 Kansas City Half Marathon, the Holy Spirit planted a dream in 7-year-old Addyson Moffitt’s heart: see every kid have clean water in her lifetime. She’d learned about a little girl in Kenya named Maurine and that many kids like her don’t have clean water. So she told her mother she wanted to run the half marathon next year and raise funds for clean water. In the days that followed, Addyson peppered her mom and dad, Shayla and Bryan, with questions — when does training start, when can she start fundraising, how can she fundraise. Shayla and Bryan prayed, asking God to lead them and Addyson as she began fundraising toward a $1,310 goal to represent the 13.1 miles she’d be running. When the half marathon arrived in October 2017, Addyson had raised more than $20,000. Around then, her family sponsored two children who live in Maurine’s community. They began writing letters and sending school photos as well as praying for them and Maurine. In spring 2018, the family ran the Global 6K for Water together for the second year in a row. By the 2018 Kansas City Half Marathon in October, Addyson had raised more than $60,000. She ran again, and then in November, she appeared on The Steve Harvey Show to share her story. He surprised her with $5,000 toward her fundraising and a trip for Addyson and her family to visit Kenya in the spring to meet their sponsored child and visit Maurine. Addyson hopes to raise another $60,000 this year, and she’s planning to run in the Global 6K for Water with her family on May 4. The post 7-year-old’s quest to end water crisis gains momentum appeared first on World Vision. What are the unforgettable moments in your life? It could have been when you drove a car for the first time or got your first paycheck. Or when your favorite sports team won a game or even a championship. What about marrying the love of your life or holding your baby in your arms for the first time? Or that moment when you realized how much the people in your life love you? For 44-year-old Nicole Wetmore, meeting her sponsored child, 5-year-old Grace, in Uganda became one of her unforgettable moments. Her unforgettable moment wouldn’t have been possible without the Global 6K for Water. Back in May 2018, the second year Nicole served as Green Valley’s Global 6K host site leader, her race bib featured Grace. “I walked on behalf of Grace because it’s a small way for me to contribute to a greater cause,” she says. Every Global 6K participant provides clean water to one person in the developing world through the $50 registration fee, and their race bib has the picture, name, and age of a child who will benefit from World Vision’s clean water work. “These are real people with real issues, and real hopes, and real dreams, and they are facing real challenges too,” Nicole says. Six kilometers, a little more than 3.7 miles, is the average distance round trip that women and children in the developing world walk for water. Imagine carrying 44 pounds of water in a 20-liter jerrycan on the way home from the water source. If that’s not enough, 15 liters is considered a bare minimum water supply for one person, so you’ll need to make a few more trips. The thought of her three sons walking for water — water often contaminated with life-threatening diseases — puts the Global 6K in perspective for Nicole. That knowledge drives Nicole to tell everyone she knows about the global water crisis and how they can make a difference through the Global 6K. How many exactly? Nearly 170 people participated in Green Valley’s Global 6K in 2018 — everyone from families with strollers carrying both children and dogs to a marathon runner who helped measure the course so that it was exactly 6K. Later that day and the next morning during weekend church services, Green Valley continued to educate their congregation on the global water crisis and how each of them can impact a child’s life in a powerful way. Nicole says it’s significant that participants can continue the relationship with the child on their race bib by sponsoring them — an opportunity to develop a friendship with a child on the other side of the world and show them the love of God, which brings hope and lifelong transformation. “When I heard about [Grace’s] story and the needs that her family has, I was really blown away and touched that I would be able to sponsor her,” Nicole says. That choice to sponsor Grace led Nicole to travel more than 9,000 miles to Morungatuny, Uganda, in October 2018, where Grace greeted her with a beaming smile. Nicole’s smile was just as bright. Nicole couldn’t help but notice the stark contrast. But despite Grace’s current circumstances, Nicole knows there is hope. Grace is one of 36 kids sponsored through the 2018 Global 6K for Water and Celebration Sunday at Green Valley, contributing to more than 2,000 children sponsored through the 2018 Global 6K. And for Nicole, as she remembers her unforgettable moment meeting Grace, there’s greater meaning behind Green Valley’s Global 6K for Water and Celebration Sunday this year. Learn more about clean water and how you can be part of the movement to end the global water crisis by 2030. Join us in praying that more and more communities, including Grace’s, would have access to clean water. Walk or run the Global 6K for Water on May 4, 2019, to provide life-changing clean water to one person in need. You’ll walk or run with the picture of the child receiving clean water through World Vision’s water projects. Give a monthly gift to provide clean water to communities lacking it. Your ongoing gift creates lasting change in a community. The post Global 6K for Water creates an unforgettable moment for a California pastor appeared first on World Vision. Choosing a college can be a daunting task. If you are going into ministry, you don’t just have to decide the college, but you have to decide the type of college. And there are all kids of options out there. You have to consider majors, locations, costs, student activities, school reputation and more in order to make one of the biggest decisions of your life. It was a while ago, but I remember making that decision myself. And, then making it with my daughters not too long ago. But, if God is calling you to ministry, there’s a whole new set of questions you will likely ask yourself. You’ll be considering the school’s view of Scripture, denominational affiliation, areas of expertise, and how your time spent in college will be used for kingdom purposes. Since I blog here at The Exchange, let me share my thoughts on why you should consider Wheaton College for your undergraduate degree. That’s one of the reasons I love working here. If you are planning to go into ministry, let me also tell you about the degree in the school where I serve as dean. It is the B.A. in Christian Formation and Ministry. So, here are some reasons to choose a Christian school, and some reasons to consider studying with us. First, I think there is value in studying at an evangelical school. Haiti (MNN) — We recently shared about Mission Aviation Fellowship’s (MAF) new airstrip in Haiti. This airstrip has opened the door for local ministry, humanitarian work, and medical access on a remote part of La Gonave Island. Pastor Carl Harris and First Baptist Church in Gettysburg, Pennsylvania sponsored the MAF airstrip, but their investment went beyond the monetary. This body of believers has established deep relationships and linked arms with the Haitian people in a way that reflects the beauty of God’s Church today. Pastor Harris says their story starts in 2010 following the 7.0-magnitude earthquake that devastated Haiti. He was watching the news and felt prompted to get his passport and shots and go to Haiti. He ended up on La Gonave — a place with several remote villages that are, in many ways, forgotten. Seeing the plight of the Haitian people on La Gonave moved Harris’s heart. Since then, he has been to Haiti 15 times, often bringing people from First Baptist Church and other local Gettysburg congregations with him. Two families at First Baptist Church are from Haiti themselves and have traveled with the church teams. Over the years, they brought construction groups, teachers, and medical teams to Haiti. In January, their doctor treated nearly 600 patients. Some of the more remote villages on La Gonave haven’t had a doctor visit in several years. The healthcare disparity was evidenced in one of Harris’s interactions with a Haitian couple. To get to the far side of the island takes around four hours by truck over difficult terrain. World Vision established a pharmacy-clinic in the remote area, but it wasn’t being used. The building was on 25 acres owned by a local woman named Albertha. That’s when they got an idea. Harris met with Albertha and she agreed to allow an airstrip on her land. Harris had already been in contact with MAF, an aviation ministry that partners with organizations to reach remote and isolated people. MAF makes flights into Anse-a-Galets, the only airstrip on La Gonave at the time. Together, they were enthusiastic about establishing an airstrip in La Source, the far side of the island. In November 2016, Harris and a Haitian man from his church named Clotaire went to Haiti to start the airstrip. They hired 150 Haitian workers and began preparing the land with digger bars, sledgehammers, axes, and machetes. Leveling the land was a monstrous task that required breaking down rocks the size of cars and moving them by hand. Then they brought in and spread topsoil. It was a two-years-long process requiring six trips for the project. Finally, the La Source airstrip was ready and waiting for approval from the government. “When we were there in January, the Haitian government had not approved it. The labor of love also came in the form of financial support from First Baptist Church. The body of believers there gave their own time and money, held yard sales, and sold food — everything from ribs and chicken to ham sandwiches and pizza — all to raise money for the airstrip. Harris says the dear friendships they have made along the way have been the most rewarding aspect of this project. “To be in this relationship with La Gonave Island and these half dozen pastors and these four villages has just been a beautiful blessing to me and to many of my people in other churches that have gotten involved. There are many things you can do to support the Body of Christ and ministry work in Haiti. First, pray for Haiti. Then, as you pray, ask God if He would have you get involved in a more tangible way in Haiti. Harris says this often simply looks like supporting the work of ministries and churches already on the ground. Header photo courtesy of MAF. Cholera is an intestinal infection caused by bacteria. The disease is often contracted from drinking unclean water. Each year, 1.3 million to 4 million people around the world suffer from cholera and 21,000 to 143,000 people die of the disease, according to the World Health Organization (WHO). Most people who contract cholera show no symptoms, but in some cases, severe diarrhea, dehydration, and death occur within hours of onset. Cholera is easily treated with oral rehydration solution, though people with severe cases need intravenous fluid replacement. With the right rehydration treatment, fewer than 1 percent of cholera patients die. Cholera is a high risk in sub-Saharan Africa where clean water and sanitation are often lacking. The disease crops up in other parts of the world when conflict or natural disasters damage water systems and displace families. The long-term solution to the global scourge of cholera is in providing access to clean water and sanitation. 400 BC — Greek physician Hippocrates describes a diarrheal disease like cholera. 1817 to 1823 — In the first known cholera pandemic, an outbreak engulfing a large region, the disease spreads from the Ganges River delta to the rest of India. The disease is thought to have originated in the Ganges Valley, where it has been known there since antiquity. Through trade and colonization, the outbreak spreads to Southeast Asia, Central Asia, the Middle East, East Africa, and coastal Mediterranean regions. 1829 to 1851 — The second cholera pandemic spreads from India as far as Europe and the Americas. 1854 — Italian Filippo Pacini first isolates the cholera bacterium, Vibrio cholerae. 1863 to 1923 — The third, fourth, fifth, and sixth pandemics also originate and spread from India, each with a slightly different strain of the bacteria. 1883 — Robert Koch identifies Vibrio cholerae as the cause of cholera in an Egyptian outbreak, contributing to the modern understanding of infectious diseases. 1961 — The seventh cholera pandemic starts and spreads from Indonesia. It continues to cause devastating losses in Africa. 1979 — Oral rehydration therapy is introduced as a standard treatment for cholera. 2010 — Because of poor sanitation after the Haiti earthquake, a cholera outbreak that starts in the fall of 2010 spreads rapidly through displacement camps. Haitian health officials reported in October 2018 that cholera infected more than 819,000 people and killed nearly 10,000 since the outbreak began. About 3,400 new cases are reported at the end of 2018. 2016 — Yemen experiences the worst outbreak in history, affecting more than 1 million people; it is still ongoing as of March 2019. The U.N. estimates that 16 million people of Yemen’s 29 million people lack safe water and adequate sanitation. 2017 — The Global Task Force on Cholera Control, led by the World Health Organization, outlines a plan to interrupt the spread of cholera and reduce deaths by 90 percent by 2030. April 2019 — In Mozambique, cholera is spreading rapidly among populations displaced by Cyclone Idai in March. A massive vaccination campaign has begun. Explore frequently asked questions about cholera, and learn how you can help children and families at risk of the disease. What is the difference between cholera, acute watery diarrhea, and dysentery? What is the difference between an epidemic, outbreak, and pandemic? Why is cholera especially dangerous for infants and young children? Is clean water really the only way to prevent cholera? Is there a cholera vaccine? How can I help people at risk of cholera? What is World Vision doing to end the global water crisis? Cholera is an intestinal infection caused by Vibrio cholerae bacteria. Most people get it from contaminated water or food. Cholera may cause extreme diarrhea, which can lead to dehydration and even death. Cholera symptoms include diarrhea, vomiting, and leg cramps. Untreated, these conditions may lead to rapid dehydration, septic shock, kidney failure, and death within hours. Children with cholera may also experience drowsiness, fever, and convulsions. About 10 percent of those who contract the disease have severe symptoms. About 80 percent of people infected by the cholera bacteria have no symptoms, and their infection runs its course without treatment. However, without proper waste disposal, the bacteria passed through their bodies can infect others. Cholera is a form of acute watery diarrhea caused by a specific strain of bacteria, Vibrio cholerae. Acute watery diarrhea is most often a symptom of an intestinal infection, which can be caused by different bacteria, viruses, or parasites. The term dysentery describes an inflammation of the gastrointestinal tract that causes bloody diarrhea. Any of several bacteria or amoebas cause dysentery. Common strains of the cholera bacteria do not cause bloody diarrhea. Cholera occurs primarily in Africa and in South and Southeast Asia, most often in tropical regions. In about 50 countries where the disease occurs regularly, it is said to be endemic. In these cholera-endemic countries, outbreaks often occur in the rainy season when drinking water may become contaminated through flooding. Since the 2010 cholera epidemic in Haiti, cholera has become endemic there. When even one case of cholera is diagnosed in a new location and determined to be locally transmitted, it is an outbreak. When cholera spreads rapidly to many people, that is an epidemic. A pandemic occurs when it spreads globally. Children can become dehydrated rapidly by the vomiting and diarrhea associated with cholera. In places where cholera is endemic — local, regular transmission — young children lack the immunity that adults may have developed over time. Also, children who are weakened by malnutrition are more susceptible to a cholera infection. Yes, the only sure way to prevent cholera is by using clean water for drinking and cooking, washing hands frequently with soap and water, and using a latrine for sanitation. But globally, 844 million people lack access to clean water. Ending Cholera: The Global Roadmap to 2030, a plan to reduce cholera deaths by 90 percent, prioritizes reaching people most in need with clean water and sanitation. A single-dose oral vaccine has been approved by the U.S. Food and Drug Administration for adults who are traveling to areas where cholera is spreading. Even with the vaccine, it is important to avoid exposure to cholera bacteria through good hygiene practices. Help bring clean water and sanitation to communities and families around the world as a World Vision supporter. Over the last three years, we reached more than 12.7 million people with clean water. Our goals for the future are even more ambitious, but achievable, with your help. Pray: Ask God to pour his blessings out on families in need of clean water. Give: Help provide clean water for children and families. Run or walk in the Global 6K for Water May 4, 2019, to bring clean water to children around the world, or make a long-term commitment to join Team World Vision in the race to bring clean water and the opportunity for fullness of life to children around the world. World Vision is the leading nongovernmental provider of clean drinking water in the developing world. We are reaching one new person every 10 seconds and three more schools every day with clean water. The post What is cholera? Facts, FAQs, and how to help appeared first on World Vision. The post The best return: Benefits and blessings of clean water appeared first on World Vision. Denominations that support and enhance the biblical mission of the local church will thrive. Those that don’t will continue to decline. Sudan (MNN) — It’s a new week in Sudan, but is it the start of a new era? Protesters don’t think so. Their demands for civilian rule continue, even though President Omar al-Bashir’s 30-year reign is over. A few days ago, the Sudanese army ousted Bashir and announced a three-month state of emergency with mandatory curfew. They also officially disbanded the government. Demonstrators ask the same question. Mistrust of army rule keeps protestors in the streets, despite military warnings. Bashir is no longer leading Sudan, this much is true — but all other details remain in flux. Initially, Defense Minister Awad Ibn Auf took the helm following Bashir’s removal. However, he stepped down the following day when protestors met his appointment with resistance. Over the weekend, Ibn Auf’s replacement — Lt-Gen Abdel Fattah Abdelrahman Burhan — removed the mandatory curfew and called upon demonstrators to “help us restore normal life.” As noted here, talks between protest organizers and the military council took place on Saturday. Are these signs of real change, or merely a temporary appeasement? “There [are] so many questions at this point in time and all of this, obviously, affects the Church,” Nettleton notes. Christians withstood severe persecution under Bashir. More about persecution in Sudan here. How will life change for Christians now that Bashir is gone? “This military leadership, what protections [will] they put in place for non-Muslims in Sudan?” Nettleton adds. A month ago, MNN questioned Nettleton about parallels between Sudan’s uprising and Algeria’s protests and the likelihood of a second Arab Spring movement. Sudan’s coup occurred roughly 10 days after Algeria’s, leading others to ponder the possibility. The atmosphere is similar to that of 2011: a frustrated public floods the streets demanding change, and they refuse to take “no” for an answer. On Friday, protests continued in Sudan despite military warnings, and they began anew in Algeria. However, some key differences set the movements of today and 2011 apart. As described here, the military is still in firm control in both Sudan and Algeria. 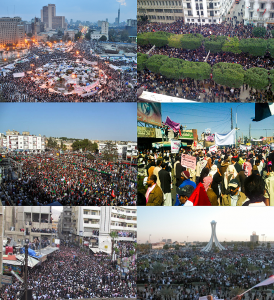 Compare this to Egypt in January 2011 – “Days of Rage” protests showed the world how quickly mass crowds of people can take power into their own hands. One reason that Algeria and Sudan may have less impact than the uprisings in Egypt and Tunisia in 2011 is that neither of these countries are at the heart of the Arab world. Egypt’s 2011 revolution, and the second revolution in 2013 that removed the Muslim Brotherhood from power, were important because Egypt is important. It’s one of the traditional centers of the Middle East and the home of Al-Azhar University, a center of learning, media and power. Amid the ongoing uncertainty and chaos, one thing is sure – your prayers are absolutely vital. Pray that leaders who honor religious freedom will rise to positions of power in Sudan. You can also provide medical supplies, Bibles, Action packs and other assistance to persecuted Sudanese Christians through VOM. Header image is a United Nations photo of 2010 protests in Darfur, Sudan.